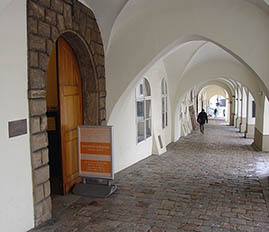 The Information Centre is located on the ground floor of the Smiřický Palace at the Lesser Town Square (Malostranské náměstí). The Information Centre provides the public with information on current events in the Chamber of Deputies as well as on the functions and bodies of the lower house of the Parliament. We pay special attention to schools and other educational institutions. We particularly focus on topics relating to parliamentarism, legislative process, parliamentary control of government and parliamentary history. Do you want to know the current status of deliberations on a bill? Are you interested in the results of voting? Would you like to know how laws are prepared, discussed and approved? Come visit us. You will find information on our upcoming educational activities and information materials in the individual sections. 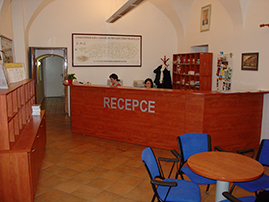 Visitors of the Information Centre can consult publications dealing with the issues of the Czech parliamentary system. Teachers at secondary schools and their students may attend seminars discussing the constitutional system of the Czech Republic, the legislative process and the functioning of the Chamber of Deputies, including a tour of the Chamber's buildings. Information materials are published in several series (e.g. on individual committees and commissions, on individual aspects of the legislative process) and in multiple languages. Visitors of the Information Centre may watch three different films about the functioning of the Chamber of Deputies.